This post is sponsored by HP Hood. I’m of the mind that eggnog is a key part of the holiday season. It’s been a family tradition of mine for years—to the point that I now consider eggnog one of the markers I notice that signals to me that we’ve entered the holiday season. As a kid it was always the leaves beginning to turn, the Halloween and Thanksgiving decorations coming out (and yes, my mom has completely separate decorations for Halloween, Thanksgiving, and Christmas), and then the Hood Eggnog appearing in the fridge. I grew up drinking Hood’s Golden Eggnog, but this year I was able to try their super creamy and delicious Pumpkin Eggnog, which is made with real pumpkin puree and warm pumpkin pie spices. It’s wonderful to drink on its own and a fun ingredient to bake with, too. 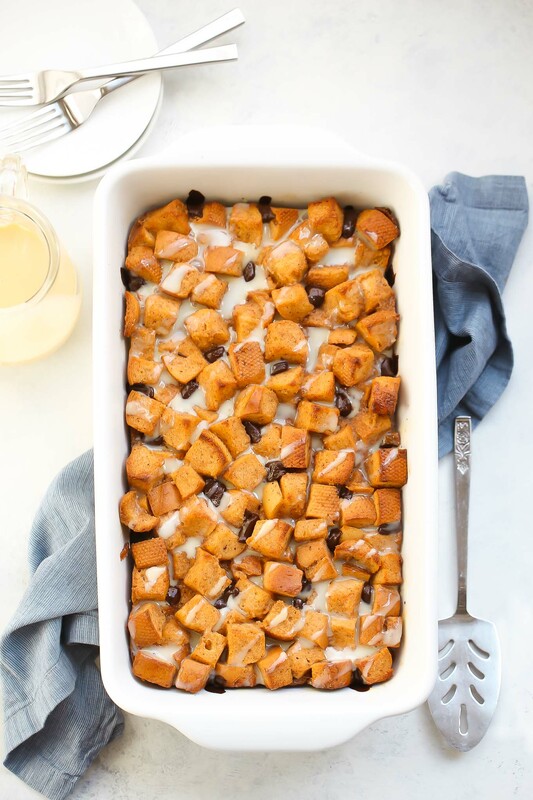 I used it in place of the cream in a traditional bread pudding to make Pumpkin Eggnog Bread Pudding with Chocolate Chips. It’s soft and almost custardy, with aromatic cinnamon and nutmeg, and semi-sweet chocolate chips to play off the creamy sweetness. The top of the pudding gets browned and slightly crisp while inside stays nice and moist. 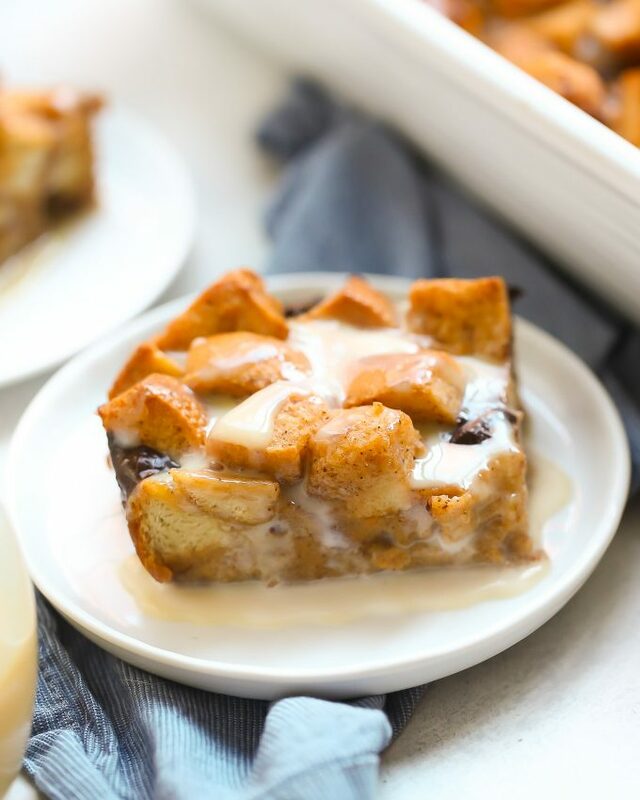 When I made my pumpkin eggnog bread pudding, I took the easy route and drizzled the top with canned sweetened condensed milk, which worked well, but I’d highly recommend drizzling yours with homemade caramel sauce (recipe below). 1. 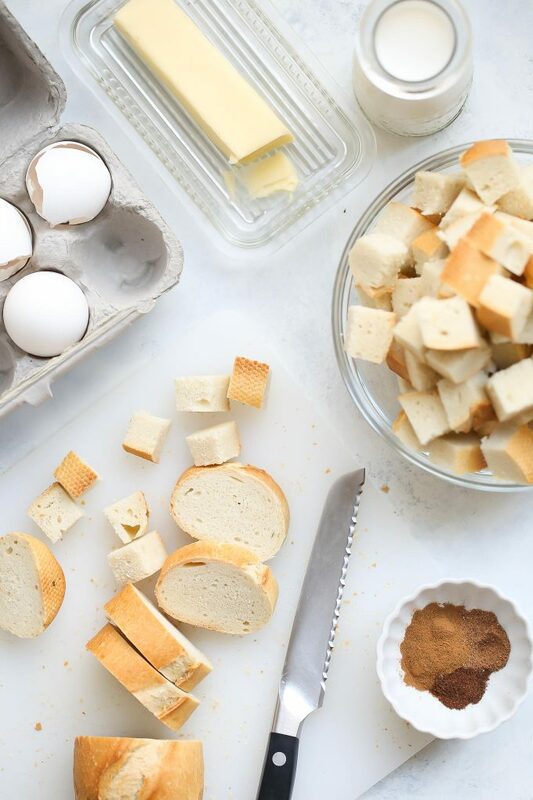 You can use either French bread (a baguette) or something softer, like challah, but either way, be sure to let the bread get stale first (by leaving it out for a day), or cut the loaf into ¾-inch cubes, spread them on a large, rimmed baking sheet, and bake at 350 degrees for 8-10 minutes until they’re just dried out. You do this because dry/stale bread soaks up the eggnog mixture better than fresh bread will. 2. 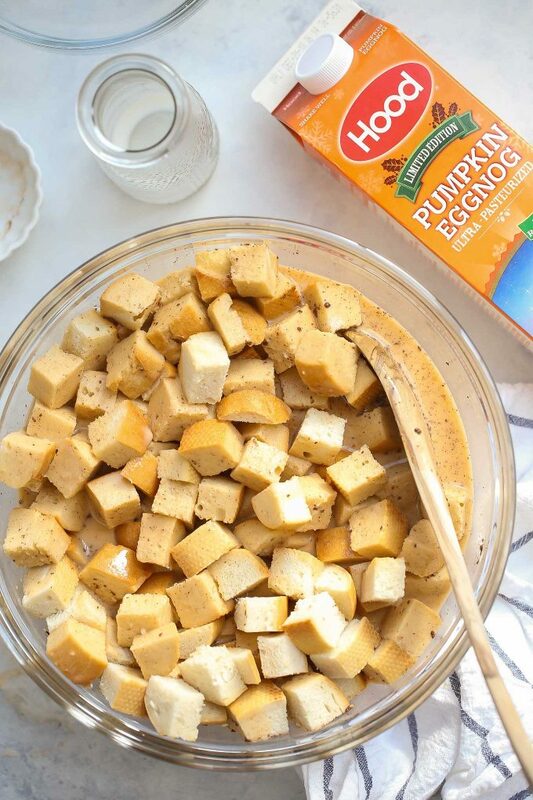 It’s best to give the bread cubes a chance to absorb the liquid before baking, so set aside 20 to 30 minutes before you put the bread pudding in the oven to allow the bread to soak in the eggnog mixture. This would make a great Thanksgiving dessert or even an indulgent weekend brunch treat around the Holidays. 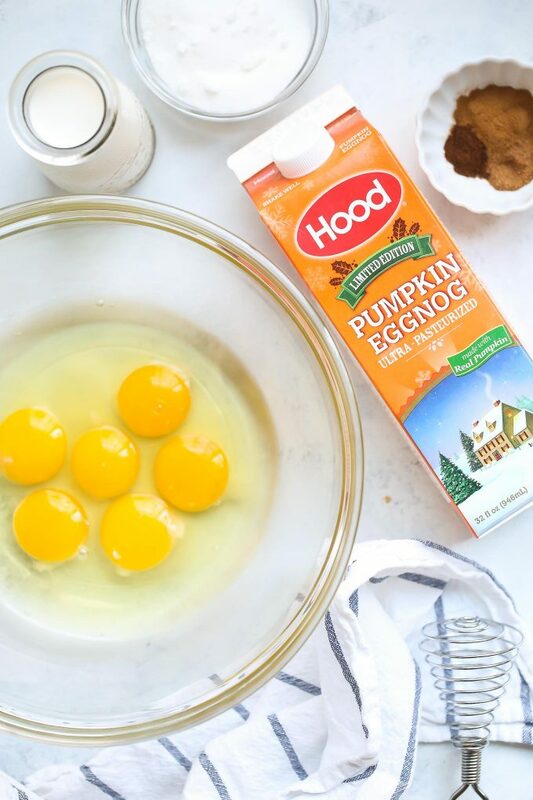 For more information and for recipes using Hood Eggnog, visit Hood.com, or find Hood on Facebook or Instagram. 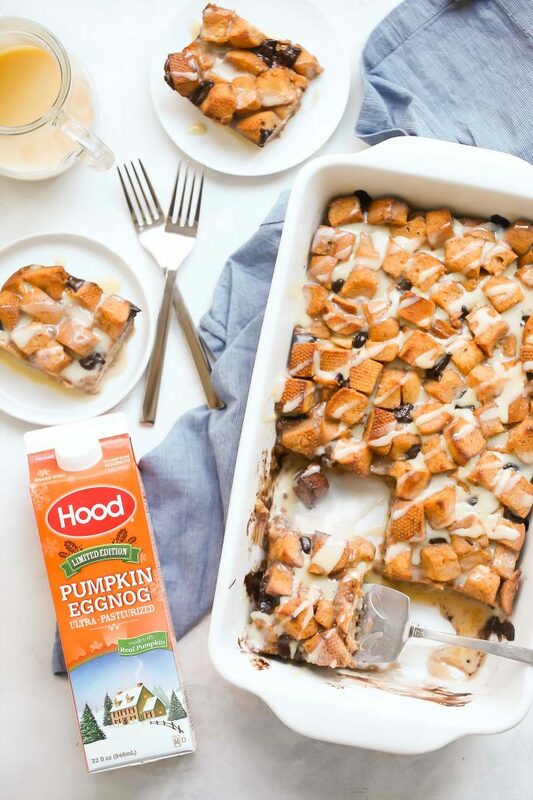 Visit your local store and try some Hood Pumpkin Eggnog while it’s still available! Preheat the oven to 350 degrees F. Butter a 2.5- or 3-quart baking dish (you can also use a 13×9-inch baking dish). 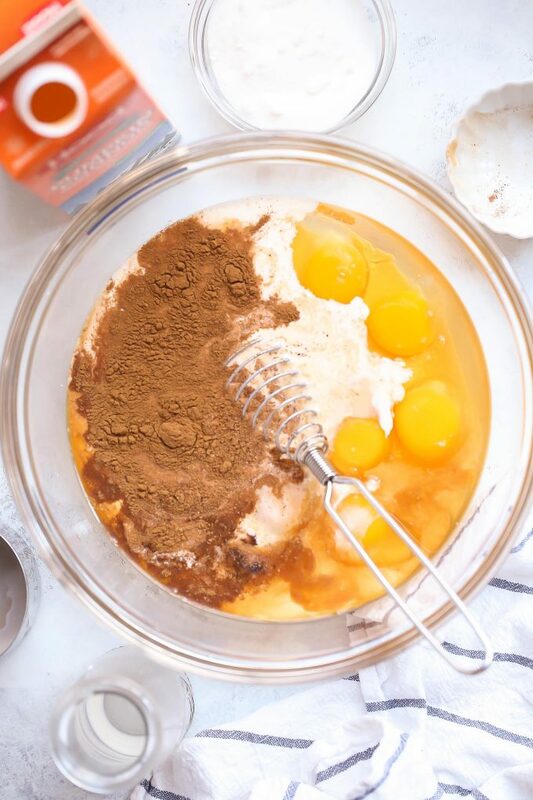 In a large bowl, whisk the eggs, eggnog, cream, vanilla, cinnamon, and nutmeg. Add the sugar and whisk well to combine. Add the bread cubes and stir to coat them in the liquid. Let the bread soak in the eggnog mixture for 20 to 30 minutes, stirring and pushing them down in the liquid occasionally. Pour the soaked bread mixture into the prepared baking dish and gently push the bread pieces down so that they’re mostly submerged in the liquid. Bake for about 50 minutes, until the bread pudding can easily pull-away from the sides of the baking dish and the center is just set (you can insert a butter knife in the center to make sure it comes out clean). 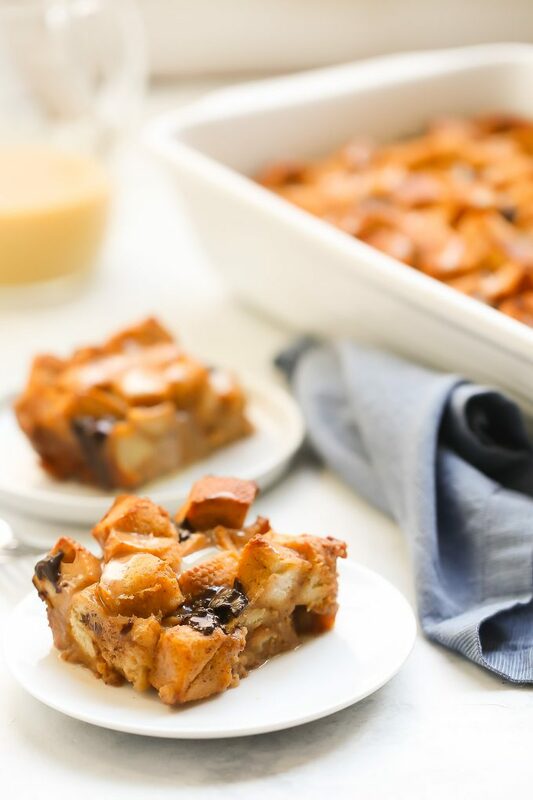 Let the bread pudding cool for about 15 minutes before serving warm with the caramel sauce. Make the caramel sauce: In a small pot, melt the butter with the brown sugar over medium heat. Bring to a gentle simmer, stirring constantly so that the sugar does not burn. Once the sugar and butter are bubbling, reduce the heat to low and slowly pour in the cream, stirring all the while. Remove from heat and let sit for 5 minutes before drizzling over bread pudding. Store leftovers, covered, in the refrigerator for up to 3 days, and reheat as you’d like.